The first expedition to search for deep-sea hydrothermal vents along the Mid-Cayman Rise deep in the Caribbean Sea turned up a bonanza. Scientists found evidence for three active vent sites, each with distinctive chemical characteristics that could support different communities of animals. The work was part of a NASA-funded effort using advanced robotic technologies to investigate extreme environments for clues to the origins and evolution of life—on Earth and other planetary bodies. 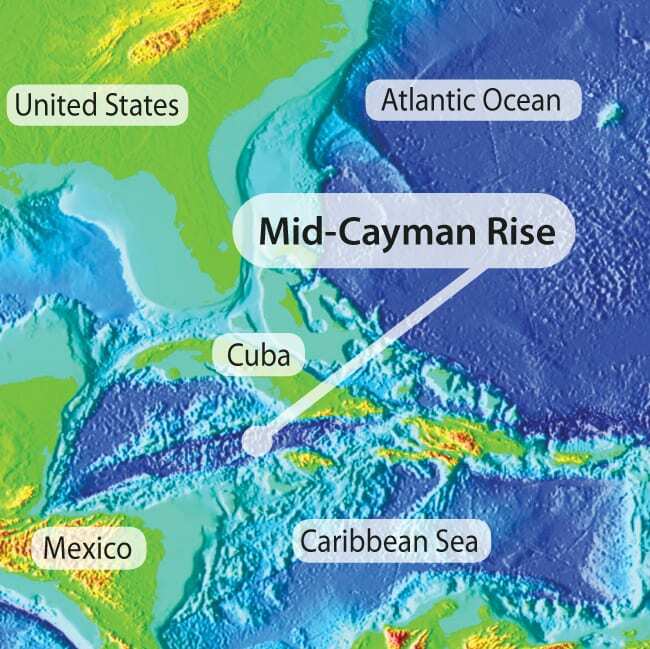 The Mid-Cayman Rise is an undersea ridge at the tectonic boundary where the North American Plate and the Caribbean Plate are spreading apart, and magma from Earth’s interior wells up to form new crust at the seafloor. As seawater percolates down through fissures in the crust, it is heated by hot volcanic rocks. It also reacts chemically with minerals in the rocks, generating hot, chemical-rich fluids that rise buoyantly and gush like geysers from seafloor vents. Microbes make use of the dissolved chemicals to grow, setting the stage for a food chain that sustains animals that are not dependent on sunlight. “Every time you find seawater interacting with volcanic rock, there’s weird and wonderful life associated with it,” German said. Vent sites with different rocks, depths, and temperatures beget different chemical reactions that can nourish different life forms. German and colleagues used sensors to detect telltale temperatures, chemicals, and particles in plumes of hydrothermal fluids spewing from vents and trailing off like smoke from a smokestack. 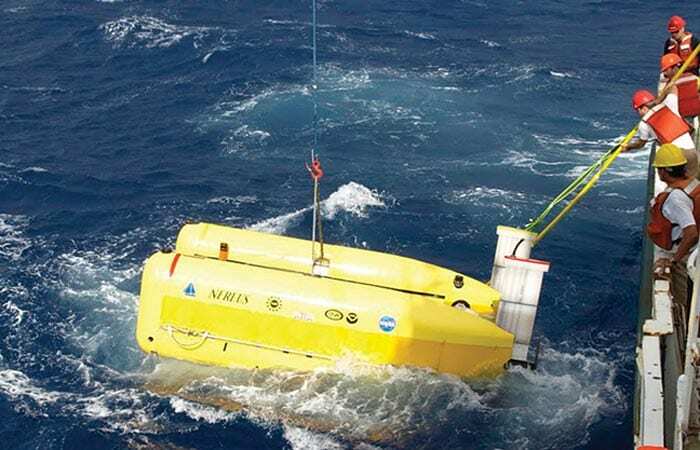 They also used Nereus, a new robotic vehicle developed by WHOI engineers to operate well beyond the depths of conventional deep-sea vehicles. In its first mission, in May 2009, Nereus dove 10,902 meters (6.8 miles) in the Challenger Deep—the deepest part of the ocean. The Mid-Cayman researchers named two of the vent sites after Jacques Piccard and Don Walsh, who 50 years ago became the only two humans to dive to the Challenger Deep. The Piccard site is about 5,000 meters (more than 3 miles) deep, 800 meters deeper than the previously known deepest vent. Chemical signatures from its plume indicated that its source is mafic rocks, so named because they are rich in magnesium and iron (ferric), which are typically formed by lava erupting at the seafloor. The Walsh site is at about the same depth, but it showed evidence for being in ultramafic rocks, which form deep below the seafloor. But they are similar to lavas that erupted at the seafloor of Earth’s earliest oceans, from 4 billion to 2 billion years ago, when life first emerged on our planet. The third site has cooler temperatures but is rich in methane. It appears to most closely resemble a third type of vent, which has been seen only once before: the “Lost City” site in the Atlantic Ocean. The team named the new vent Europa, after a moon of Jupiter that is believed to have volcanoes at the bottom of its ocean, and hence is a prime NASA target to search for life beyond Earth. 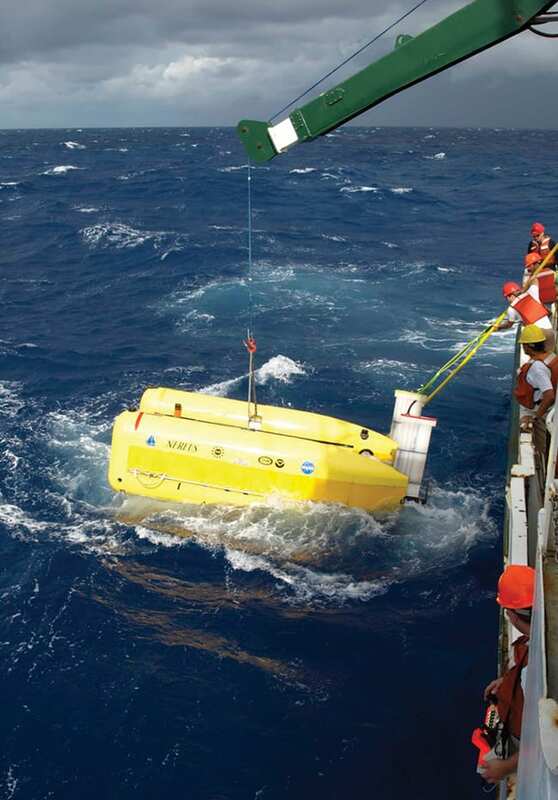 Halfway through the six-day expedition, tropical storm Ida intervened and stopped the team from viewing or sampling the vent site. Though they had come within 250 meters of the vents at the seafloor, they had to ride out the storm for the last three days of the cruise and return to port frustrated. Happily, however, all was not lost: The research team shared their findings with an international team led by Jon Copley of the National Oceanography Centre in Southampton, UK, who returned in spring 2010 and imaged active vents at both the Piccard and Europa locations using a deep-towed camera called Hybis. The scientists reported their findings August 10, 2010, in the Proceedings of the National Academy of Sciences.